We have your rocketry needs wrapped up in one place. Have you seen NASA Education’s Rocketry website? Here’s a list straight from the source. • Answer the question: What is a rocket? • Investigate and learn about rockets at NASA. • Learn the terms that the rocket scientists use. • Visit the Rocketry Image Gallery. • Read about the careers of rocketry experts. • Learn about the history of rocketry. • Check out lesson plans for your classroom. • Stay up-to-date with information about NASA-supported rocketry competitions. 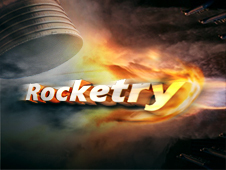 • Watch and download video and multimedia features about rocketry. • Browse NASA websites for information about rocketry. For students, the site features the interactive How Do Rockets Stack Up? in which students can compare model rockets to the real thing. The site also has an image gallery with more than 50 rocket-related images. The multimedia section has links to more images, interactive pages, videos, animations and podcasts. For you the teacher, the site has lesson plans, a career corner in which scientists and engineers talk about their career paths in the field of rocketry and their work at NASA, a page of opportunities for participation, and a link to related sites. Students will find information and media that they can use to create a first-rate podcast.